1850s moody Victorian young man in Union case. Excuse the somewhat terrible iPhone photo. The actual tintype looks so much better. The case has a lovely leather backing and measures 3″ 1/4 by 3″ 1/2. The picture is very sharp and this photo doesn’t do it justice; there is no shadow to the left and it misses out on all the lovely details of the hat, bow and brocade waistcoat. This young sitter has a very moody expression and almost looks disdainful -something that is more easily seen with the naked eye. The hat with the side flaps is interesting. He’s wearing a large bowtie worn over the coat. This was most likely taken anywhere between the mid 1850s and 1860s. Definitely a favorite of the period. This one came from an antique dealer in Alabama. 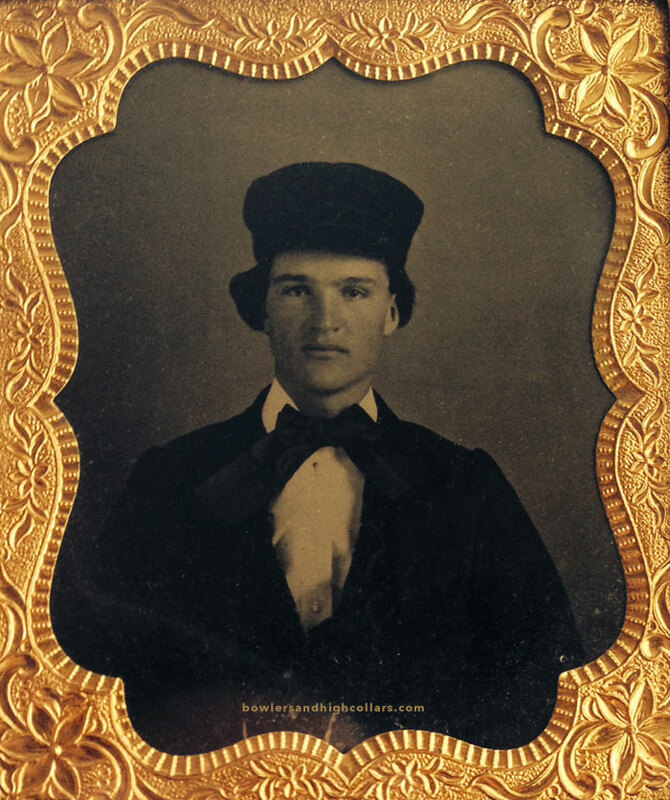 This entry was posted on Wednesday, May 20th, 2015 at 5:41 pm	and tagged with 1850s-1860s, bowtie, handsome man, unique hat and posted in Teens, Tintypes. You can follow any responses to this entry through the RSS 2.0 feed. I wonder. I can’t find references on the hat. I would have liked to know if it had to do with a certain chosen profession maybe.